Evenly divide selected layers time by current composition time, you can choose whether starting from the in-point of the layer or the out-point. 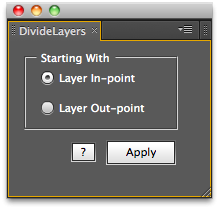 This script evenly divide selected layers time by current work area time, you can choose whether starting from the in-point of the layer or the out-point, for both normal layers and reversed layers. The ExpressionTimeline allows you to apply several expressions to a property, so that each expression is ony active for a certain period of time. Instead of an abrupt change between expressions, you can smoothly transition from one expression to the next. What's more, you can specify time intervals in which no expression is active, so that the keyframed motion is considered. Adds a user definable number of frames to the in and out points of the selected layers. Randomly shifts the selected layers in time within user defined range. Allows for correct input of Arabic text in After Effects. This "Text Mod" allows you to use Arabic text in TypeMonkey, pt_ImportSubtitles, pt_OpenSesame and pt_OpenSesame Server. Please note that you need to own one of those products in order to use this add on. Enter Arabic Text from right to left with proper medial letterforms directly into Cinema 4D as a text object or vector.